I am a 30-year-old male who has over eight years’ experience working for Aerospace and as mechanical maintenance. On my days off I have worked at a popular restaurant in Hammersmith. I am a very hard worker, and this is one of the reasons I would love to work as a live-in carer. I grew up with my Mother, Father and three sisters and we are a very loving family. I’ve spent a lot of time looking after my Mother as she is disabled. Because of this I am very experienced in tending to the needs of people who have limited mobility. I’m an excellent all round handy-man and enjoy preparing healthy meals. 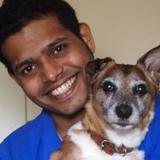 I love sports, physical exercise and I’m great with animals so would be very happy to help a client who has pets. My wife works as a live-in carer and her stories have inspired me to do this kind of work. We will both attempt to find work as a couple in the same field. at some point in the future. My friends describe me as a very friendly, patient and kind person with a great sense of humour.